When you emigrate from another country sometimes the tendency is to eat food from the culture you are used to. I know my great-grandparents were a bit like this when they first moved to the U.S. My grandfather was raised in a Portuguese home that ate Portuguese food. But then there are others, like Vanessa of Smart Little Cookie who embrace food. Period. From everywhere. Rather than being boxed in by sharing recipes from her own culture, Vanessa’s blog is an exploration of really tasty food she discovers from all over the world. Particularly if you have a sweet tooth! I wasn’t always a great cook. That was something I grew into because I really like food. Eating is honestly one of my favorite things to do and if that is what makes one a foodie, then I can say I have always been a foodie. Cooking the things I love to eat and being creative in the kitchen is really something new for me and I’m enjoying every bit of it. I actually started this blog in 2011 as a school project. At the time, I was obsessed with cupcakes and learning to bake and a professor recommended I started a blog to improve my writing skill since I was a communications major. Unfortunately, it was very hard for me to manage school, both my kids, the house, the husband, the blog and multiple internships. The blog was always an afterthought and at times completely ignored. It wasn’t until a month ago that I decided to follow my passion of sharing my love for food through blogging and decided to retake the journey only now I’m more focused and with a lot more cooking knowledge. At the end of the day, I cook to eat and I have a serious sweet tooth. That is why the food I like to cook most is sweets. Anything from cookies to cupcakes or just about anything sweet like this Chocolate Coquito (Chocolate Flavored Coconut Eggnog). I’m very much in touch with my Hispanic roots and culture. 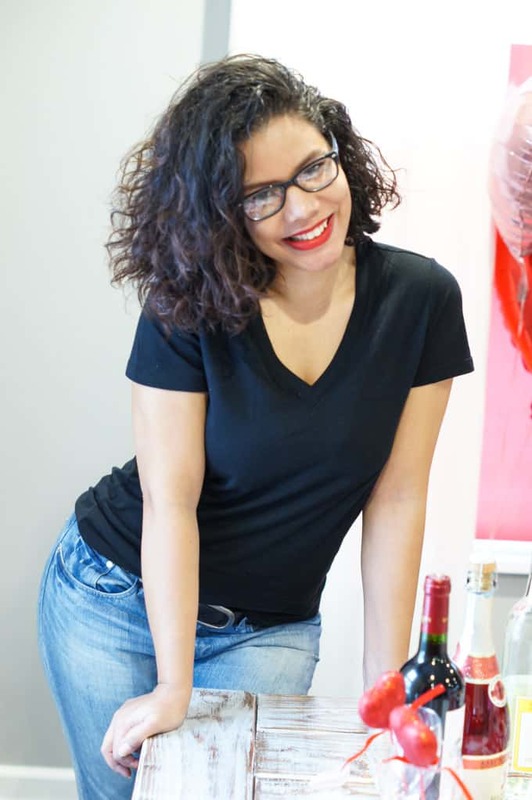 I come from a small Island in the Caribbean called the Dominican Republic and my favorite foods to eat are really any of the foods I grew up eating: rice, beans, meat stew, and any fried food. Such unhealthy eating habits, but fried food is really my favorite like this cornmeal fritters. However, I also really enjoy trying different foods and flavors from around the world. My comfort food is Sancocho. This is a Latin dish that is simply a meats and vegetables stew. It just brings me great childhood memories of my grandma cooking up a big batch back in the island to share with family, friends and neighbors while enjoying a fun evening out in the patio. But when I’m tired or stressed, cupcakes and wine sooth me. I am just in love with these almond cupcakes. I can’t stop making them. My perfect food day consist of a day out trying as many different foods as possible. I love to go out on a nice warm day and restaurant hop. Last summer a couple of friends and I took a chocolate tour around New York City. The guide took us around the meat district into a number of bakeries and chocolate stores, where we were able to taste anything we wanted. Then, we visited the World Trade Center Memorial and had lunch at a great Mexican restaurant nearby. After leaving the restaurant, we stopped for ice cream. That was a good day. Lindsay from Pinch of Yum has really been an inspiration to me. I love her casseroles and her pasta dishes are to die for. Her food photography is amazing. Aunt Clara from Aunt Clara’s Kitchen has just thought me saw much about Dominican cooking and the dishes I grew up eating. I love going into her site looking for specific dishes I remember eating as a child. I know I can always find the recipes there. Melissa at Hungry Food Love shares simple unique Latin recipes that will make you want to go home and just cook everything on her site. My only advice would be to just do it. With the number of blogs out there, it can be really intimidating at times. Don’t give up, follow your passion, keep posting and the rest will come with time. Keep up with Vanessa’s tasty tidbits on Twitter, Facebook, Instagram, Google+ and Pinterest and of course by visiting Smart Little Cookie. How about you? What would you like to ask Vanessa? What’s your favorite sweet? You had me at CHOCOLATE and COCONUT together with eggnog! Yum! @Lindsey, Chocolate and Coconut is one of my favorite flavor combinations! Everything looks so good! Send me a taster! Vaness and I would get along swimmingly! Every tooth in my head is a sweet tooth! Love the background and looking forward to checking out her site! Yum! I love sweets (too much) and I enjoyed reading your post! Of course… PS You have fantastic photos., too! So great that she started this during school. What a good professor to encourage her to do so. She has some nice looking treats! Thanks for sharing. @Kelly, I know I love how blogs are part of a lot of college classes now! It really is great how blogs are being incorporated into school learning. I’m grateful and happy to say I did have great professors. Blogging has helped me tremendously career wise. Yum. Checking out the recipes that Vanessa mentioned. They all look so delicious. Thanks for sharing. @Estelle, her recipes are hard to resist! Wow! All that food looks amazing! @Melanie, I know the danger of reading food bloggers! Oh my, you’ve got my mouth watering now. Your photos are amazing! @Doreen, I have not had almond cupcakes before and I am anxious to try one! I would like to ask Vanessa to come over and cook this stuff for me! OMG yummm! I am with you, I have a huge sweet tooth so a lot of the things I cook and bake are sweet! Those Almond cupcakes look SO good! @Tara, what is your favorite sweet to make? There are too many to count! Brownies, Cookies or Scones I love scones! I want to go on a chocolate tour! That might be dangerous for me since I do love sweets!!! @Tori, I agree, they have one in Paris too and I am afraid to go on it! Oh, I totally share Vanessa’s sweet tooth! I can’t take my eyes off that chocolate coquito! Adelynn, it is definitely an acquired taste, I have never heard of a chocolate version and now I am dying to trying it! @Adelynn, Believe me when I say this Chocolate Coquito will have you changing your mind about eggnog. And it is such a simple recipe. Unlike, regular eggnog it doesn’t have any eggs in it. 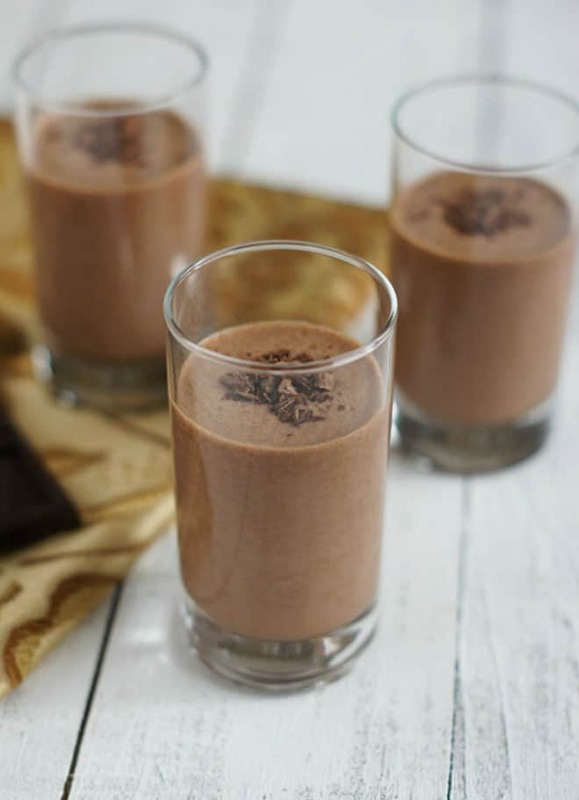 @Krysta, I never of heard of chocolate eggnog before – I love chocolate and I love eggnog so I totally want to try this! 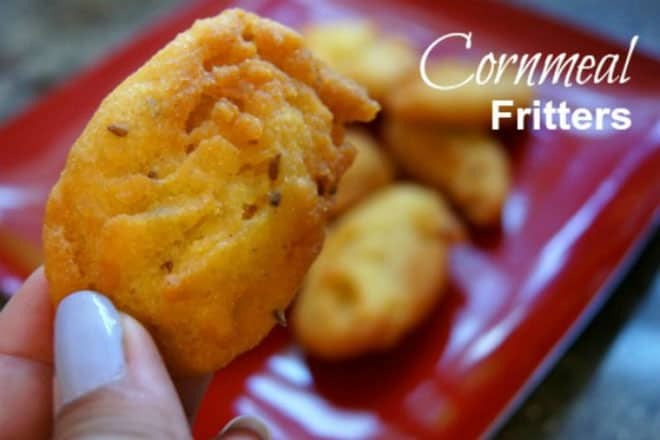 @Krysta, Cornmeal fritters are my favorite! I make it just for fun all the time. And trust me that Chocolate Eggnog is amazing! You must really try it. Those almond cupcakes look so so yummy! @Shannon, I think so too, I have never tried almond flavored cupcakes before! Thanks for introducing us to Vanessa! Those corn fritters look amazing! I think I know what I will be making this week. The cupcake look every so yummy! @Carolann, isn’t she beautiful and those fritters are so tempting! Great interview! Her food looks amazing! @Jess, thanks! I am in love with those fritters! her food looks amazing! I MUST try that eggnog! @Carrie, I want to try it too! Chocolate eggnog together sounds out of this world! It is always so neat and inspiring to hear how a little side project for school or just for fun turns into something big and so special! @Jenn, I know, I think it is really cool! What a fun highlight! And I agree, her food looks divine! @Cara, I had not either but it does look so good! @Cara, Sancocho is the ultimate comfort food in the Dominican Republic. I encourage anyone who has never had it to try it. I recently added the recipe to the blog. If you would like to try it, I definitely recommend checking the recipe out. I’m sure you’ll love it! My boys have big sweettooths. Everything looks so good. Great post. I love learning more about the bloggers behind the blogs. 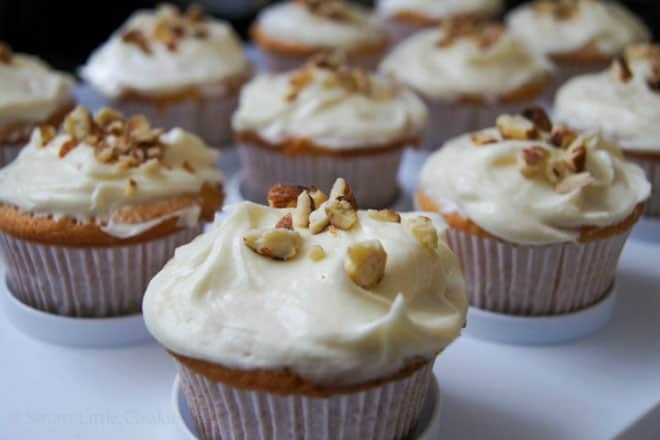 Almond cupcakes sound sooooo good right now! Sweet tooths of the world unite! You have me drooling over here! Those cupcakes look incredible, as does everything else! Those Corn Meal Fritters look GREAT! We make our own cornmeal from corn that we grow here and I usually end up with 12-15 gallon bags in the freezer each year of fresh-ground cornmeal. It’s soooo yummy but, finding enough recipes to use it seems impossible. This is another one I will be adding to my list and trying very soon! @Stephanie, freezing them, what a great idea! All those foods sound and look delicious!! I made my way over and started following Vanessa! I’m loving her blog so far! I love these interviews because it helps connect us with other food bloggers I would probably have never found! oh my gosh those Almond Cupcakes and Chocolate Coquito sound amazing… I am suddenly starving! It all looks so good !! I’d weigh a ton if I cooked like you do and you don’t look like you eat much of what you make !! I love this series and getting to know a little more about other bloggers. Thanks for introducing us all to Vanessa’s Smart Little Cookie blog, I’m excited to check it out and try out some of her recipes! Everything looks so delicious! Now I need a break from the computer. Kitchen, here I come! The almond cupcakes sound and look so good !! I have to go to the store now. You have made me to hungry !! Thank you for sharing ! I am a sweet tooth. Everything looks so delicious! All of this looks so great! Thank you so much for sharing. That’s some great questions!! And I do like the idea of a Coconut Eggnog! I always admire those who can take beautiful food pictures and make beautiful food! This was a great interview. I would love to hang out with her! And she gave great advice for anyone who wants to start blogging. I have to make the Chocolate Coquito. Looks irresistible! Those corn fritters look really good! I love all sorts of sweets..too much actually! I feel like I’m a foodie too although I don’t really blog much about foods. I’m going to have to visit Smart Little Cookie because I love to bake and cook and although I’ve never tried Portuguese food, it’s one of the things I’d like to try this year. And maybe sushi.. maybe. 🙂 Thanks for sharing this food blogger with us. awww I love coming across new food bloggers! ( I am a food blogger myself) I am always interested in knowing what inspires others. I think her photos are awesome! All of her food looks amazing!! I think my favorite would be the Almond cupcakes. I also have a huge sweet tooth and cupcakes are one of my favorites to make as well. Great interview I love to learn about other bloggers. That cupcake is whispering to my ear “Grab me!” lol. Those looks so tasty right now. Great advise, despite some discouragement I encounter in blogging, I still continue to post because I love to write and I love to connect with other bloggers as well. I learned so many new things just by reading other blogs. We could be friends for sure. I love those cornmeal fritters, and cupcakes are my comfort food! My question is how do you stay in shape? 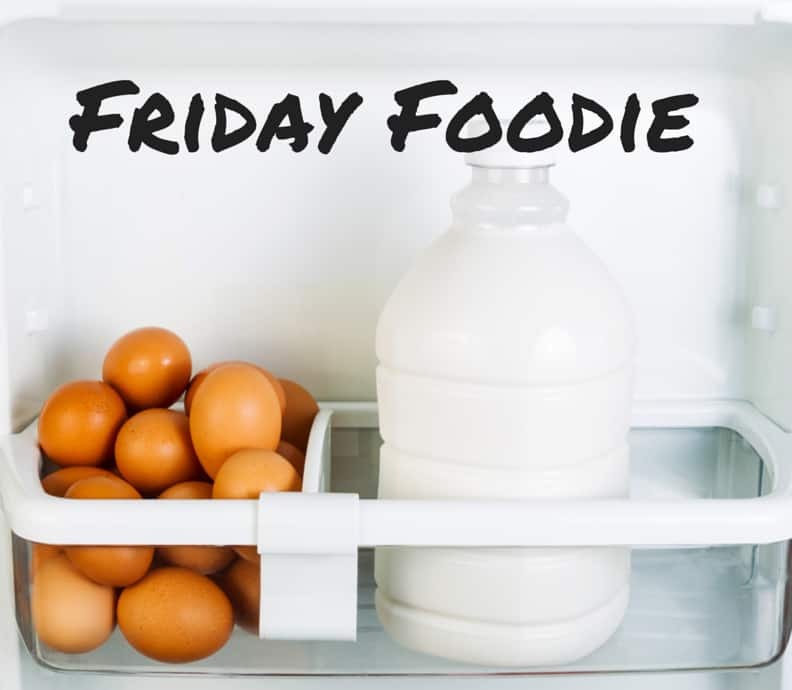 You look great and I’m wondering how do you maintain while indulging in these foods? I consider myself a foodie because I love food but I don’t really like to cook. I love food blogs so thanks for the great interview and introducing me to four new blogss. Lots more reading to do. Yum! Love the recipes you shared. The chocolate coconut egg nog sounds delicious and those almond cupcakes – AMAZING. I also have a food blog and it’s one of the greatest things I’ve ever done for myself. And just like you, Pinch of Yum is one of my inspirations! Such an awesome blog to follow and learn from. I would love some cornmeal fritters! Yum! great pics! Made me so hungry just now! lol thanks for sharing! I have a really bad sweet tooth too!! Although, since I have had kids, I tend to stay away from the sweets and make healthier treats! I love getting to hear about how other bloggers started out. Thanks for sharing! i have a serious sweet tooth too! ugh. i want sweets now!